With Mother's Day just around the corner, I thought I would share a few of my projects that would make great gifts…and they are easy to make while being easy on the budget as well! There’s a little bit of everything here…from no-sew to light sewing, some painting and some iron-on transfers! I have to say that there’s nothing like getting a gift that was handmade…it really makes it extra special! 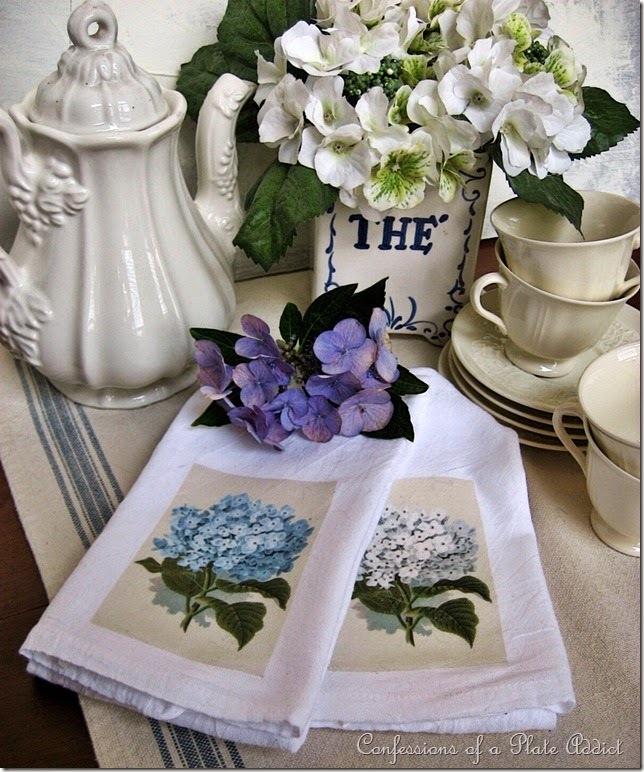 Aren't these hydrangea tea towels pretty....and they are super easy and inexpensive, too! The free graphics are included in the post. 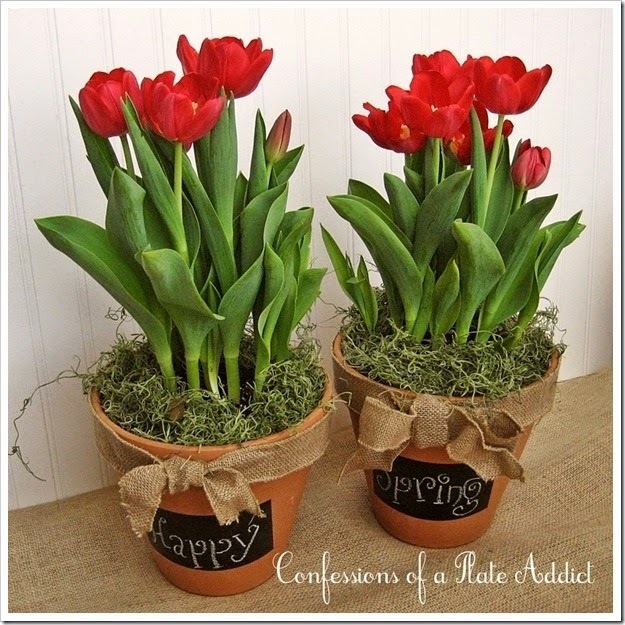 These chalkboard flower pots are another fun and easy gift idea...and you can add your own message, too! Or how about a pretty grey willow French basket with a chalk tag to personalize...and you can fill it with special gifts for her! I love this Country Living inspired ruler table runner...a fun addition to the everyday table! Isn't this a fun and different way to present Mom with flowers...and they will last until fall, too! 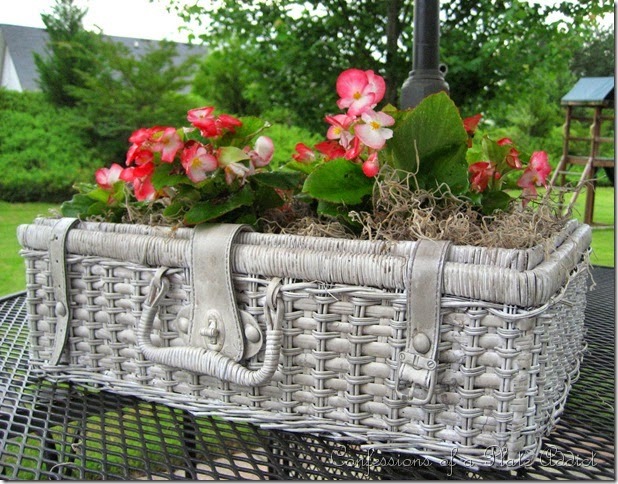 This shabby picnic basket planter is easy and inexpensive to make but looks like a million! And speaking of tea towels, don’t you love this vintage French tea towel pillow…made from a pretty tea towel and backed with burlap! Here’s another easy one… a chippy chalkboard with a pretty ribbon and a wreath! And you can dress it up for Mom with a little messsage! Finally, no more confusion about which glass is whose with these chalkboard wine glasses! A little chalkboard paint on the stem base and …voilà! This is just a sampling of the projects that you will find in my Project Gallery…where I have collected over 150 ideas for you to try! I hope you will head over and check it out! 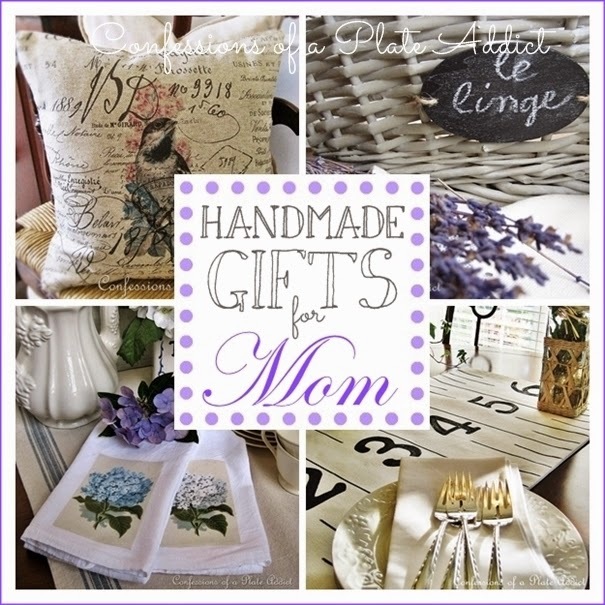 And for even more inspiration, check out MORE HANDMADE GIFT IDEAS FOR MOTHER'S DAY! Thanks for stopping by! I hope you enjoyed seeing my handmade gift ideas! Please visit these wonderful bloggers and their beautiful blogs to see what they are up to and to find a list of this week’s participants. What wonderful gift ideas and oh so clever! Thought I had a favorite, looked at them again, all of them are favorites! Love all these ideas! Any of them would make for a beautiful gift! Thank you for the inspiration! Wow! 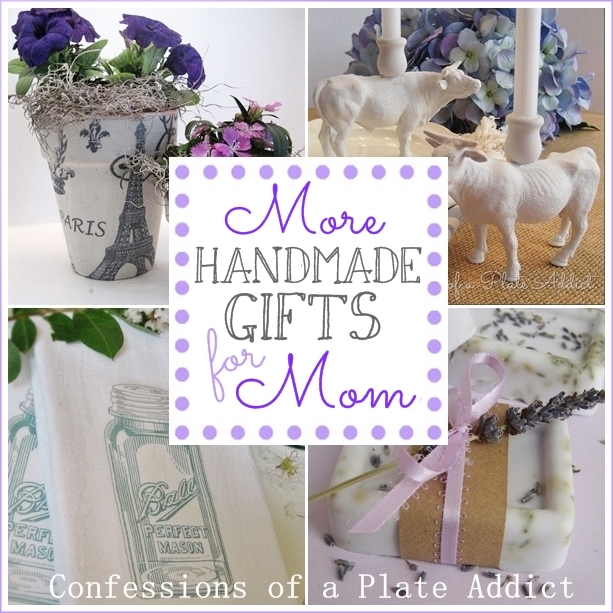 What great ideas for Mother's Day or any other gift giving day! Thank you for sharing your ideas and talent with us. My head is spinning with enthusiasm...now which one will I pick? Beautiful choices, but it made me so sad as Ozzie is the spitting image of my beloved kitten whom I recently lost after a courageous battle. 25 years was a long kitty life, but it's never really long enough. Thank you for the image. These are all such great gift ideas. Thanks tons for linking to Inspire Me. Gorgeous inspirations! LOVE the tea towels and aged paper...thank you for sharing!